Often organisations of all sizes can overlook the issue of security without considering the implications. From theft, to more serious issues, confidentiality is crucial to protect both your customer and in-house data. Security will also give customers a reason to trust and rely on you over some of your competitors. Here are just a few ways to increase your security through on-site shredding. The actual process of shredding confidential documents reduces the likelihood of them being able to be recreated from the remains. Businesses can sometimes be careless and allow private documents to end up in the bin, in one piece, risking the information being stolen. If sensitive information is taken, it can lead to further problems such as legal issues and damaging your reputation. Take the initiative to stop these problems by simply shredding your documents. Manually this could be a time consuming process, but with services provided by specialists such as Shred-on-Site, you won’t even need to think about it. This ties into the next way that on-site shredding increases your security. To avoid any missed documents, you will want to ensure that you are shredding regularly and efficiently. Storing a huge amount of paper to be shredding can be tricky, but with shredding receptacles such as veneered consoles, this should not be a problem. They are specially designed to allow storage on top, with easy access to remove for on-site shredding. The slot in the top means that documents stored in there are locked away and cannot be re-accessed once put inside, so no confidential data can be taken out. This way, the volume of shredding need not be a worry for your business. 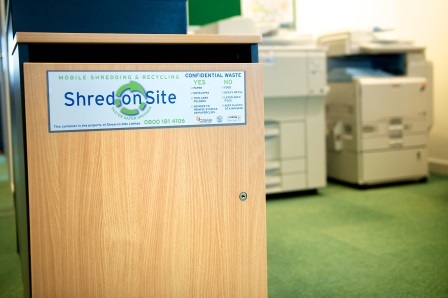 Regular collections will keep your shredding on track for you, whilst shredding it on-site will never allow the secure documents to leave your workplace premises in one piece. There is no need to take any extra time or effort when you can have your documents all shredding for you, at your location, without any hassle. The best way to make sure that your shredding is all catered for is by allowing experts to take care of it for you. Not only will it be more efficient for you, but it will ensure that you are disposing of your documents in a way that is fully secure, but also in compliance with confidential document disposal laws. Shred-on-Site offer a number of options from one-off to regular collection and disposals using their mobile shredding vehicles. There are also a range of storage options from veneered receptacles to bags to store documents in before shredding them. To find out more, get in touch with Shred-on-Site today on 0800 181 4106.